A woman is texting while crossing White Street in Danbury Thursday, Dec. 13, 2012. You wouldn't dream of texting while driving, knowing full well this form of multitasking can have deadly consequences. But a new study shows that many of us are perfectly comfortable with texting while walking, and experts said that can be just as dangerous. The study, published this week in the online edition of the journal "Injury Prevention," detailed the behavior of pedestrians at 20 high-risk intersections during randomly assigned time intervals throughout the year. Of the 1,102 pedestrians studied, about a third performed a "distracting activity" while crossing the street. Of those engaging in attention-sucking multitasking, 7.3 percent were text messaging. Other activities included listening to music (11.2 percent) and talking on the phone (6 percent). Texting in particular seemed to affect how quickly and safely people crossed the street. Researchers observed that texting pedestrians took 1.87 seconds longer to cross the average intersection than undistracted walkers. But it's hard to quantify how many accidents involve texting because it's not something people usually admit, said Dr. Michael Werdmann, chairman of Bridgeport Hospital's emergency department. "People are actually much less good at multitasking than they believe they are," Werdmann said. "If you're doing some significant activity -- even one that's somewhat automatic, like driving or walking -- you need to realize that taking on a second task is going to affect your ability to do the first." Werdmann said he has personally observed people on the street bumping into one another because they were more focused on their smartphone screens than the sidewalk in front of them. And those people are more likely than undistracted pedestrians to display at least one unsafe behavior, such as crossing against the light or failing to look both ways, according to the study. The report also points out that crashes involving vehicles and pedestrians injure 60,000 people and kill 4,000 every year. 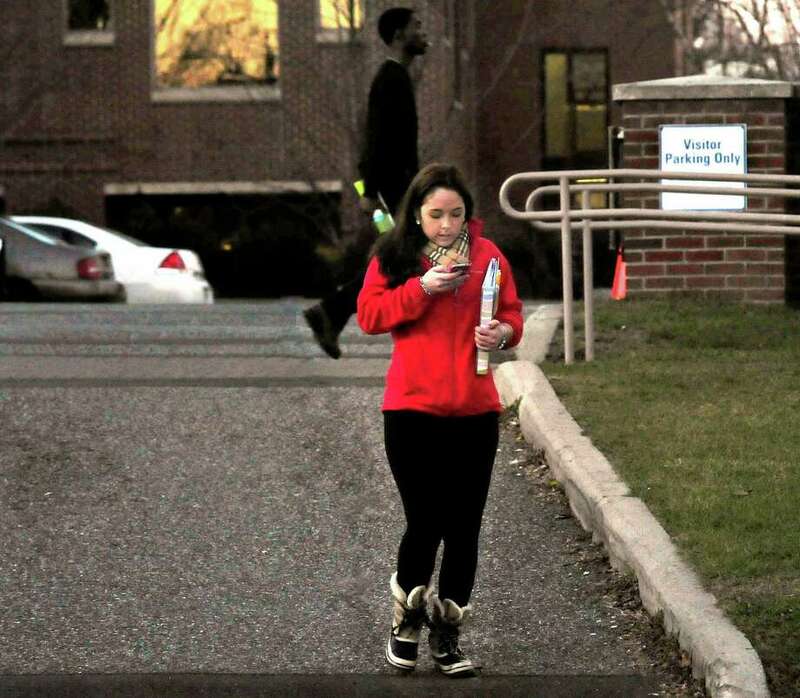 In Connecticut, there have been several incidents in which a pedestrian was injured while texting. One of the most serious occurred last year, when Western Connecticut State University student Dong Lin was hit by a car and killed on White Street in Danbury. Lin, 19, of Brookfield, was reportedly texting a friend when he was hit. Bridgeport Police Lt. William Mayer recalled a less grave incident a year ago, when a pedestrian was struck by car while texting, but wasn't severely injured. Chris Davison, medical director of Greenwich Hospital's emergency department, remembered a patient admitted to the hospital six months ago who fell and broke both forearms because he was texting while walking. "It was pretty traumatic," Davison said. "There definitely is a risk of injury to texting while walking, just like there is while driving." But both Werdmann and Davison said they understand why people are loathe to put down their phones. "It's addictive," Davison said. "(A smartphone) is like a leash. Werdmann even admitted that he's been guilty of texting while walking. "One of these days I will probably fall down the stairs," Werdmann said. "I hope not."